The increased number of online users is the reason why internet providers are doing well in terms of business. With an internet connection present, accessing news and entertainment is just within our reach. But has the Internet made television obsolete? If you answered ’0-10 hours per week’ and the reason is because of the internet, then perhaps you would agree that Internet is cannibalizing television. In fact, the internet is killing TV in one way or another. With torrent and entertainment sites like The Pirate Bay and Get Glue, who says we still need to open the television to watch “True Blood” on HBO and allow advertisements to ruin the momentum? And with Youtube around, there’s no more need to worry about missing our favorite news or teleseryes, right? Throughout the years, there has been a sea-change on both the way we look at TV shows and TV sets. A lot of shows produced and shown on TV are created just for the sake of having one to show to fill in the time slot. However, when we look at it, work takes away a big chunk of our day’s free time. This means that a lot of people are not actually home during the day to watch TV shows. If there are, those would mostly just be house helpers and kids. Television channels are wasting their money on producing shows that only have low audience turnout. Wouldn’t it be better if they just produce shows online, so people can choose what to watch during their free time? Wouldn’t it be better if kids at home just spend time on learning and activities, rather than getting addicted to watching television shows? Bill Gates once said that television as we know it today will be obsolete in the next few years. Why? Television sets are not portable as it is with a laptop and a broadband dongle, and does not allow the organizing of files. People today live in a fast-paced world. As such, we are used to multitasking and having everything portable, so we can have access when we need it, where we need it. In terms of earning, it’s true that there has been no sustainable business model to make money out of online streaming and downloads. But I think it’s just a matter undergoing a paradigm shift. When TV networks change the way they think and do business contracts with advertisers, earning via the internet will just be similar with television. Forget about the brands or sites and just think of the idea of having shows online. Is it better to have a cable television or a cable internet connection? Is it better to watch online or in television? And again, has the internet made television obsolete? You be the judge. This article is my eighth contribution to Manila Bulletin -- one of Philippines' leading broadsheets -- published on March 28, 2011 (Monday) in the TechNews Section. You can view the PDF version here. Anyway, as I was saying, when I was teaching Multimedia Writing (scriptwriting + storyboarding), I came across some research findings that said TV enjoyment depends on your social status/income bracket. Those who were born of upper middle to upper income families usually tune in to international cable channels or just rely on DVDs. In my case -- and I consider myself to be among the lower income folk because I'm career transitioning (my parents are the ones who are of upper middle status, not me) -- I only bought myself a TV so that I can play video games. looks like it is... I only open my TV when my fave shows are up, which is 1 hour a day, or on occasions when the news are grave like the Tsunami event and Reyes' suicide! 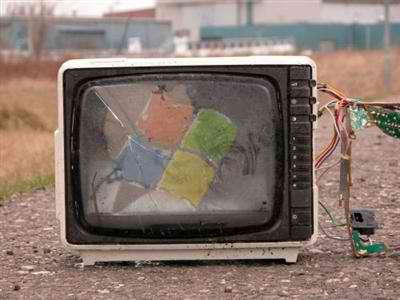 I don't think the Internet is making TV obsolete as a whole. It does pertain to certain aspects of television. News networks and music channels are casualties. People don't want news delivered to them, they search for it. People don't want to "request" and wait for music videos to be played on Channel V, they go to YouTube. The portability issue is insignificant to the medium of television. I personally want to sit down on a couch and watch television. I don't want to sit down on my desk and do the same thing. Something TV has that Internet doesn't is consistent quality, technically speaking. Internet streaming quality is very poor. Nothing beats the emerging HD technology prevalent in other countries. It's somewhat true that the use of TV has been minimize because of the Internet. Personally, I only sit down and turn on my TV whenever I wanted to watch my favorite TV show, after that I would go back in front of my computer. Analog TV broadcasts ceased in the United States in February 2009. While other parts of the world still use analog TV it is already becoming obsolete.